Within millennia of domestication, crops and their seeds underwent traceably different adaptive trends, allowing rapid speciation and divergence that lead to phenotypic and genotypic distinction to their wild ancestors. Promoted by these dynamic processes, also the microbiotas have secretly coevolved with the host plants. 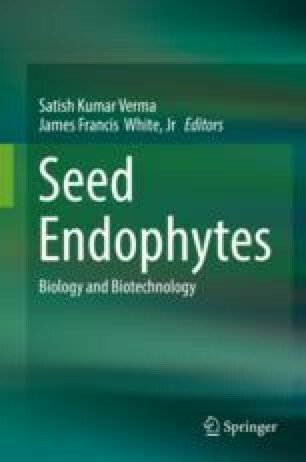 Recent studies revealed an unexpected microbial diversity and abundance within seeds with bacterial endophytes as symbiotic components. Soil type, climate, geography and plant genotype were identified as main drivers of the seed microbiota. In addition, domestication and intensive agricultural management changed the seed microbiota. This resulted in a loss of diversity, which has consequences for one health-related issues. In order to restore microbial diversity, bacterial seed treatments can be designed. They can be reconstructed based on the rich diversity of seeds of wild ancestors or other native plants. The resulting seed biologicals can be harnessed for sustainable agricultural approaches by improving stress tolerance and resilience of modern crops.